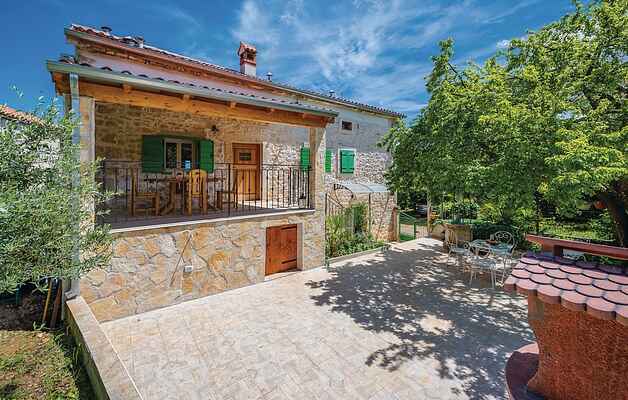 Spend a well deserved vacation in this beautiful autochthonous stone house with pool, located in a small Istrian village near Labin. The house is decorated with keeping the traditional elements that give it a special charm. It consists of two accommodation units connected by an external staircase. On the ground floor there is a beautiful, charming studio apartment, while the floor and the attic extend outward from a kitchen with living room, three bedrooms and a bathroom. Two bedrooms for children and additional toilet are located in the attic, with a min. ceiling height 110 cm. Spiral stairs lead to the attic, and the bedroom no. 2 is passable toward bedroom no. 3. During the summer months, you will find refreshments in the pool and relaxation with a good book on the spacious terrace or by preparing your favorite barbecued meals. Be sure to visit the historic core of the old town of Labin on the hill, while in Rabac you will find the most beautiful beaches in Istria and the crystal clear sea.